Removing CND Shellac nails at home is a breeze by following the step-by-step instruction below. You don't need to go to a salon to have it removed. With Shellac removal, there's no filing and no damage to the nail bed making it safer to the nails. 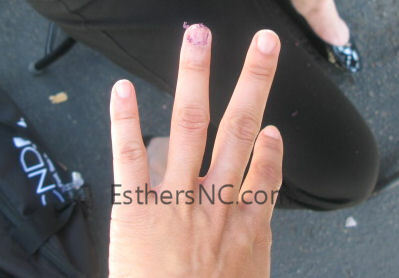 Compare this to gel polish that needs buffing on the nail plate to break the seal. 1. Take one shellac nail wrap and saturate the cotton pad with Pure Acetone. 2. Place the wrap under finger and fold the saturated pad over nail and wrap around finger ensuring a tight, snug fit. Secure wrap with adhesive tab. The CND logo should be on top of the nail. Leave wrap for 10 minutes. 3. With a twisting and wiping motion, slowly pull off the wrap from the nail. 4. This is how the nail looks after pulling the wrap. There is still a lot of residue. 5. Gently clean the nails from Shellac residue with a wood stick. Be careful not to scrape away the surface layers of the natural nail plate. Don’t use metal pusher as it will scrape the layer of the nail. 6. Wipe clean nail with lint-free nail wipe saturated with Acetone. Now the nail is clean and ready for another nail polish application. Or use and massage Cuticle Oil on nail if no nail polish will be applied. My nail was as clean as it was before application. 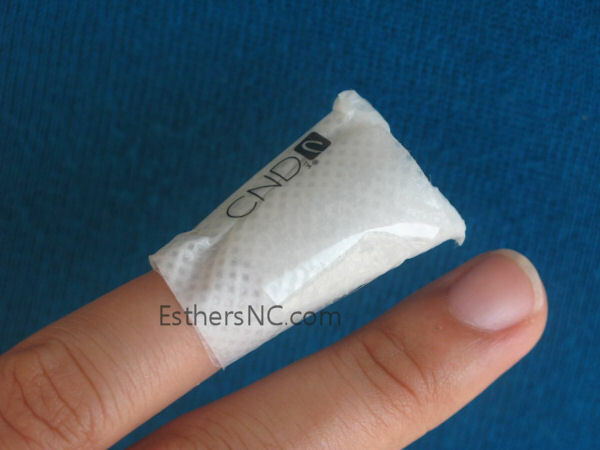 CND Shellac removal is best done with Shellac remover wraps to minimize Acetone use. 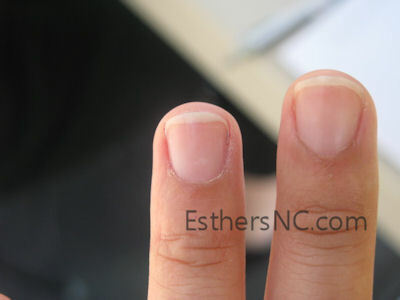 Soaking nails with Acetone will make the nail and cuticle dry; thus, encouraging weak and splitting nails in the future. 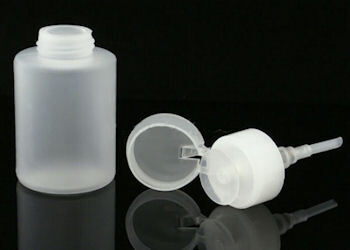 Use a pump bottle like this to minimize messy application. Sounds easy to do? It sure is. All CND Shellac polish, wraps and pure acetone are available at Esther’s Nail Center. Visit us for CND Shellac products, Gelish, Daisy Gel and other manicure pedicure supplies.